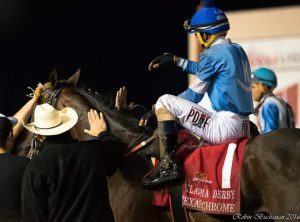 Texas Chrome, who was a Lone Star Park yearling purchase, has captured the heart of many racing fans, especially in Texas. 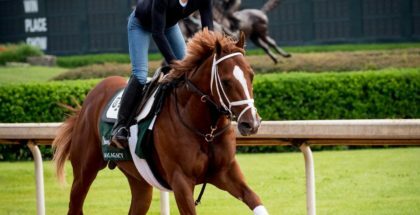 Currently on a three-race win streak, he will get a chance to capture one of the biggest races of the weekend in the Breeders’ Cup Dirt Mile (GI). With an exceptional career so far and clear heart and determination, he reminds me a lot of Mine That Bird, another horse who shined when no one believed in him after winning the Kentucky Derby at 50-1. Texas Chrome earning the win in the 2016 Oklahoma Derby. An astonishing performance over heavily favored Sharp Azteca in the Louisiana Downs Prelude and a gutsy win over Dalmore (who race in the Pacific Classic against California Chrome) in the Super Derby (GIII) led to a thrilling win in the Oklahoma Derby (GIII) over a very tough Stickstatleydude after the rail opened up just enough to make his way through to took over the lead in the stretch. It was a gutsy ride by jockey C.J. McMahon and it took a horse with a big heart and the confidence to get through that narrow opening in the lane. McMahon guided him through the opening, but you have to have the horse that’s willing to do that. RB: How did you get the mount on Texas Chrome? C.J. : I was actually in Puerto Rico with my girlfriend on vacation after the Lone Star Park meet was over this summer. My agent texted me and said that Mr. Caldwell wanted me to ride on Texas Chrome at Louisiana Downs for the Super Derby Prelude. I ended up flying back to Lafayette the next day since my vacation was over, drove to Oklahoma and worked some horses. Then drove to Louisiana Downs and met up with Mr. Caldwell and Texas Chrome, rode him, and we got along from there. The funny thing is I’ve raced against Chrome before when he was a 2-year-old. I was never able to catch him. Being able to now be his jockey is such a blessing. RB: How do you feel about Texas Chrome’s big fan following? C.J. : I think it’s awesome! 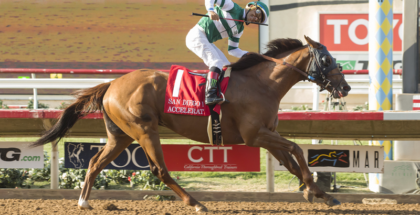 Being a Texas-bred horse and to have won the races he has won going from a shorter distance to a mile and an eighth is tremendous and he deserves all the following that he gets. He is going in with just as much confidence as any of the other horses. He has one of the biggest hearts of a horse that I have ever ridden. Jockey C.J. McMahon and Texas Chrome after winning the Oklahoma Derby. RB: What is Texas Chrome’s Personality like? C.J. : He’s pretty laid back. He’s pretty easy to get along with and just needs light hands. The only time he’ll be aggressive is when he’s in the post parade rooting his head against the pony. Other than that he’s the perfect horse to deal with. He’s not so much of a handful or does anything that he’s not supposed to. You pretty much ask him to do something and he’ll do it for you. RB: Your career has come a long way, what has been your biggest challenge on the road to becoming a successful jockey? C.J. : Me personally, I’m my hardest critic. I’m very hard on myself. Even though the trainers or owners say, “we’ll get them em’ next time” I’ll be at home or in the jockey’s room watching the replays a couple of times seeing what I could have done better or looking out for the mistakes I made that may have got me beat or if I was flat out, out run and try to correct them. It drives me to work hard every day, to remain humble and ride every race like it was my first race. RB: Who was your favorite jockey growing up? C.J. : My dad, Charles Mcmahon. He is a Quarter Horse rider. 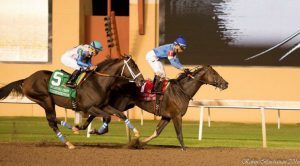 He’s won the All American Derby at Ruidoso Downs and placed third in the Champion of Champions at Los Alamitos. I owe a lot to him for teaching me everything I know. My parents put me on my first horse and I loved it from there. RB: What have been your biggest accomplishments so far? C.J. 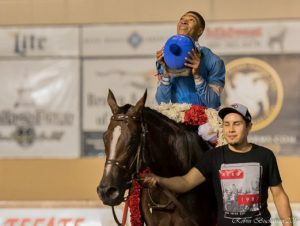 : Winning the Lone Star Park leading rider title last year, winning the Super Derby and, of course, the Oklahoma Derby. I think winning the Super Derby topped everything so far. 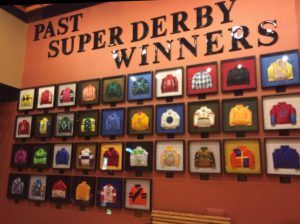 Being a kid going to Louisiana Downs, my dad was a jockey during their Quarter Horse meet and I remember the Super Derby wall. Right by the gaming room there is a wall that has all the previous Super Derby winners with their silks and their connections. I’ve always wanted be in the Super Derby and I never thought I was going to be in it, let alone actually win that race. It was a big honor to win the race for the connections and my family. My brother, my mom and my girlfriend work a lot and they don’t get a lot of time to take off work. It was a true blessing for them to be there and witness that race. It really meant a lot to me. When you work hard, your hard work pays off when you win a race like this. RB: How do you feel about riding in your first grade 1 race, your first Breeders’ Cup and your first time at Santa Anita Park? C.J. : It’s a blessing for sure. Being able to ride in one of the most prestigious days out of the year in Thoroughbred racing is definitely a blessing. It’s going to be awesome and I can’t wait. RB: Are you nervous about the Breeders’ Cup? C.J. : As of right now, not really. I’m just taking it one day at a time riding my normal day horses and trying to win races for them. In reality, I’m not going to say it’s just another race because obviously it’s not. I’m going to go out there and be as clear-headed and as focused as could be without getting too nervous. It is a Grade 1 Breeders’ Cup race so it is hard not to be, but I’m just going to give it my best. My birthday is actually the day after the race. 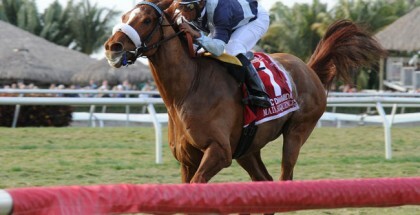 It would be a great birthday gift and a sigh of relief if (Texas Chrome) is able to win the race. RB: There is a lot of pace in the Breeders’ Cup Dirt Mile. How do you think the race will unfold? C.J. : There is going to be a lot of early pace to run at for sure. I can’t let Texas Chrome fall out the back door. Good horses can go fast and keep going like Dortmund or Gun Runner. That’s the reason why they’re in these races. It will set up well for Texas Chrome since he’s very versatile. He can sit off the pace or be close with the leaders. If they go out in let’s say, :23 in the opening quarter, I won’t be as close as I was like in the Super Derby Prelude race at Louisiana Downs. Looks like it’s going to be a really good pace scenario to set up and there will be some hot fractions. These horses in this race are not pushovers, but I have all the faith in Texas Chrome, Mr. Caldwell and all the connections for this race. They will have him ready. It’s stiff competition but we have just as good of a chance as anybody. RB: Is there anything you want to say to anyone and to all the people reading this? C.J. : I would like to thank all the owners and trainers giving me the opportunity to ride their horses. My agent, Robert Kelly, who motivates me and gets me going. He’s done a tremendous job representing me for the past year and a half. My family who has always been supportive of me. My brother texts me every morning and inspires me, my mom is an angel, and my dad very supportive too. I couldn’t thank them enough for all the things they have done for me and my career in riding. They have always been there for me and always gave me the encouragement to keep riding. I would also like to thank the fans because we would not be around if it wasn’t for them. Work hard, stay humble, and always keep God first and everything else will fall in place. It might not happen at that moment but eventually it will. *Be sure to follow C.J. on twitter (@McMahonJockey) and trainer J.R. Caldwell (@JRCaldwell1) for all information about Texas Chrome.